Long, long ago - experience taught me the smoothest way through life is to "never make recommendations to anybody about anything." Sam and I have learned to qualify those don't-miss-it things encompassing: great places to eat, visit, read, watch, etc. For example, we now say, "The food was great the night we were there," or "You would love the movie if you enjoy such-and-such." With all of those lessons in mind, I'm unequivocally saying, "Get your hands on Hummingbird Gardens as soon as possible." I don't think the co-authors, Nancy Newfield and Barbara Nielsen, have yet realized the true scope of what they have accomplished. I knew Nancy was working on a book with somebody, but thought it was strictly for the southern Louisiana area. When Sam brought home my unexpected copy, it took only a few minutes of browsing for me to tell him something like, "Good lord, this thing is really, really good - and I mean good!" That's saying a lot for a person who is not easily impressed, and the more I read, the better it got. 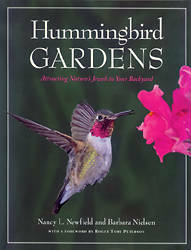 Somehow, Nancy and Barbara truly did it all in Hummingbird Gardens by combining a wealth of well written, informative text with spectacular photographs of both the hummingbirds and the flowering plants so loved by these creatures. The beautiful birds and blossoming plants are well covered in their own separate chapters. At the same time though, the content flows smoothly into pertinent regional information for those in: California, The Pacific Northwest, The Southwest, The Western Mountains, The Southeast and The East and Midwest. They so skillfully blend bird and bloom with helpful tips and enthusiasts' experiences that you will want to read on and on about other hummers in other gardens! As far as I can determine, they left no stone unturned. All who open its covers will soon learn to appreciate the inclusion of subjects often left out of other publications. This one did not forget such things as: References and Further Reading (great bibliography), Resources (supermarkets for the hummers' favorite natural foods), and an excellent Index. One last thing. Although Hummingbird Gardens was primarily done for the millions of us who simply love and enjoy these particular bounties of nature - I sincerely believe ornithology, as a whole, will gain as well. The professionals cannot be out in the field all of the time, thus what we see "our" hummers doing in our yards can contribute a great deal to the science. Meanwhile, we are very lucky, indeed, that Barbara and Nancy decided to share their knowledge and discoveries with the rest of us! Hummingbird Gardens is out of print. Copies may still be available from various Internet outlets.